All you educators will enjoy this site and its sense of humor. This comic has particular links to the state of gifted education in the US. Imagine, you as an adult, sitting in a workshop where the instructor is slowing down the delivery of information to a snail’s pace so everyone can keep up. What do you do? Start flipping around in the book, draw, write notes to your neighbor, pull out your cell phone, go to the bathroom, etc. You have been taught over time just how far to go with your off-task behavior in a public situation. Now, imagine you are ten years old! It’s critical that we meet the needs of the identified gifted in our midst before they develop coping behaviors that have to be untaught later in their academic life. In my last position in a private school just for gifted, I needed more than half the school year to correct my students off-task behaviors before I could truly teach them. Alternatively, these students needed to trust that I would provide them with active, engaging learning situations. Both are a gradual processes. This comic highlights that when we try to “level” the learning in the classroom, we loose our brightest minds. Our goal is to meet the academic and social needs every student under our care or offer alternative situations where they can receive help or acceleration. 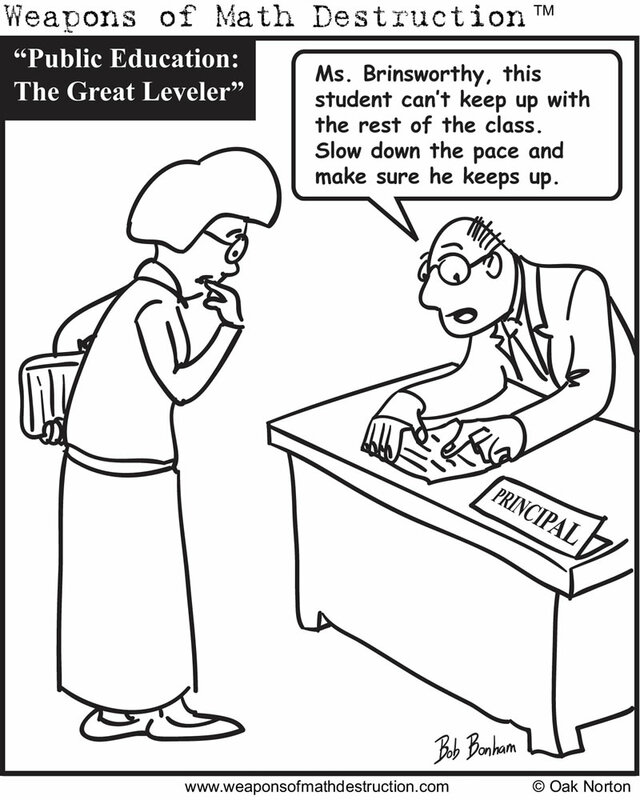 Leveling needs to take on the new meaning of “every student is learning to the level of their needs”. Recently, I listened to Hillary Clinton during her nomination to be our next Secretary of State talk about everyone reaching their potential in our nation. Does she truly know what that means? As a kid in elementary school I would pull out whatever paperback I was reading that week whenever I’d finished the assignment early, turned in a test ahead of time, or waited for other groups to finish. To me, efficiency came with a reward: momentary escape, and a chance to read just a few more pp. Yet I was discouraged from doing this by several teachers. At the time I thought I was being disruptive. Looking back I can’t believe the ignorance pushed down by the teachers, and I regret that I bowed down to that idiocy. If I were in school today I might be reading the same paperbacks, or I might be reading articles online on my phone, or looking up things on Wikipedia, or, sure, texting with my parents or friends. If a student has met the objectives of a lesson, why shouldn’t they use the spare time however they see fit? It sounds like seat time has taken the place of achievement. Interesting comments. I often go quickly through the first “layer” of my lesson so that I can grab the kids who are going to get it fast. Then I go back and slowly reteach to others. I have been asked to instead, wait till everyone is ready and then go one step…etc. That’s not for me. I was also that kid. I wanted to just do it! Now I capture the enthusiasm of the speedier kids and they help me reach some of the others. It’s such a delicate balance. Every lesson is pretty different. I love the challenge, though. I hope that I am helping some to reach their potential! Thanks for joining techteachers. I hope that we can be supportive of each other!